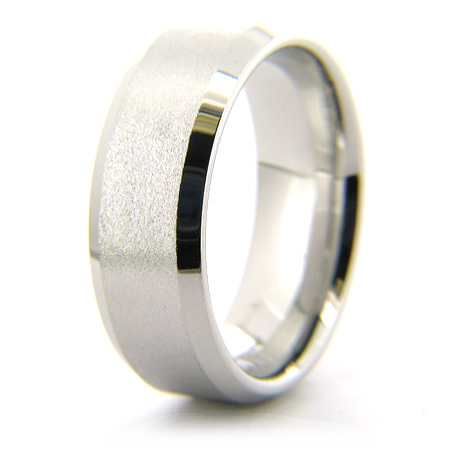 This cobalt chrome ring has a flat center with stone finish and polished beveled edges. Cobalt Chrome is a unique alloy blend that consists of cobalt and other substances to form a bright white alternative metal. It is as white as platinum, hypoallergenic, unbreakable, and scratch resistant. These bands are light-weight, inside round comfort fit and very comfortable to wear. This metal has been used in medical applications for years. Occasional polishing may be required. Weight: approx. 9 grams. My husband has been very satisfied with his wedding band.